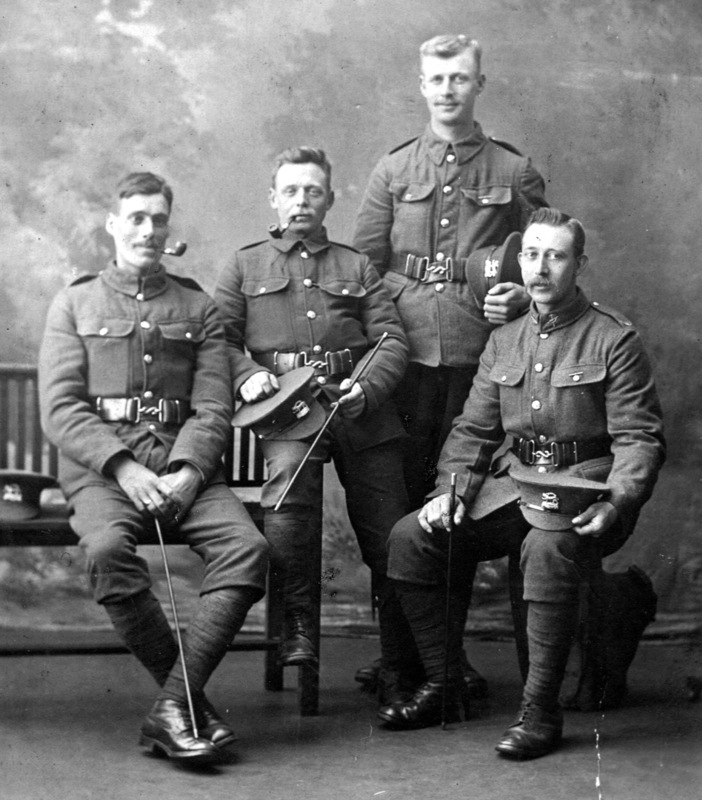 Recruitment photograph taken in the photographer's studio - Percy Allcorn is sitting, on the right. From the private collection of Mrs Jill Bagnall. Percy Leonard Allcorn was born in Bottesford in 1888, one of the children of William and Elizabeth Allcorn. William, his father, was born in 1856 in the village of Pembury, Kent. By the time he was fifteen he was working as a carter’s boy in Frant, East Sussex. Sometime later, he started work as a railwayman. By 1881, he had become a signalman, posted to Bottesford. By this time, he was also a married man. His wife, Elizabeth, was born in 1856 at Frant. Their first son, Arthur William, was born in Bottesford in 1880. They lived at 2 Elton Road, one of the terrace of four cottages below the embanked railway bridge on the road from Bottesford to Elton and Nottingham, which are still known as the South Station Cottages. In the census of 1891, their home was recorded as 2 New Station Cottages, at the New Railway Halt, Nottingham Road, Bottesford, but this was most probably the same house as they had lived in ten years before. There were now five children at home: Arthur William (11), George (9), Florence (7), Beatrice (5) and Percy Leonard (3), all except for Percy at school. In 1901, William and Elizabeth still lived at the New Station Cottages, though now at number 3, and William continued to work as a railway signalman, as did Arthur William, the oldest child. They had added three more children, Frederick (9, born in July, 1891), Francis (7) and Frank (5), all at school. Percy Allcorn passed his fourteenth birthday in 1902, and may have started working at about this time. On the date of the 1911 census, he was 23, single, living at 239 Portland Row, Amington, Tamworth, and employed as a colliery labourer. However, he evidently left the pits to work on the railway, as indicated by his entry of the 26th June, 1915, which records that P.L.Allcorn, 27, was admitted to the National Union of Railwaymen, Bottesford Branch. William Allcorn senior’s death was recorded by the Grantham Journal on the 15th September, 1917. He was 62 and died after a long illness. He had worked for some forty years as a signalman at Bottesford, and had taken an active part in the work of the NUR for 20 years, being Branch Secretary for 13 years. It added that as an amateur gardener he had gained a great local reputation, and had been for years one of the most successful exhibitors at the Bottesford Horticultural Society Shows. Percy Allcorn served as a Private in two regiments: first the Leicestershire Regiment, Service Number 26884, then in the Devonshire Regiment, Service Number 30123. His MIC confirms that he was awarded the British War Medal and Victory Medal. His record in the WW1 Service Medal & Awards Rolls 1914-1920 adds the that after his initial posting to the 12th Leicestershires, he was transferred successively to the 9th Devons, the 8th Devons and finally the 1st Devons. Information from The Long Long Trail website tells us that the 8th and 9th Devonshires entered France in 1915 and became part of the 20th Brigade of the 7th Division, before being moved to Italy in 1917. Then in 1918, the 9th Brigade returned to France where it became part of the 21st Division. The 1st Devonshires followed a similar course, being in Italy in 1917 then back to France in 1918. The 7th Division was part of the Battle of the Somme in 1916 and later battles in Flanders in 1917 including Paschendaele, then in Italy it saw further action including the Battle of Vittoria Veneto. The 21st Division remained in France from 1915 through the war. It therefore is probable that Private Percy Allcorn came through a great deal of the fighting. Interestingly, records show that at least four of the boys served in WW1, Percy, Fred, Cecil and Frank, the youngest. Percy Leonard Allcorn got married in 1920 to Harriett Lynn. Electoral Rolls, including those for 1925 and 1931, record that Percy and Harriett lived in Normanton, and the 1939 Register records that Percy and Harriett Allcorn continued to live in Normanton. His occupation was given as “permanent way length”, which probably means a platelayer. Percy Leonard Allcorn was 77 and living in Normanton at the time of his death in Nottingham on the 18th March, 1966. He had retired from the railway, but apparently continued to work as a carpenter with the Bottesford-based building firm owned by W.J.R. (Bill) Roberts. One story is that he made the wooden cross at Grantham Crematorium, a building constructed by WJR Roberts in the 1960s. He was also active in village social life, and was a member of the Forget-Me-Not club in Bottesford. In his will, he left £1078 to Sarah Jane Culpin and Beryl Haskey.